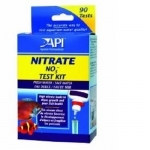 API Pond Nitrate Test Kit Tests for nitrate levels in water ranging from 0 - 160 ppm. High levels of nitrate are a food source for unwanted algae & indicate poor water quality & can lead to health problems for fish. High nitrate in aquarium water is associated with algae growth, a built-up of organic pollutants and poor fish health. Use this kit to measure nitrate so that, if detected, steps can be taken to remove it. 2 liquid droppers with child-resistant safety caps, easy-to-read instructions with information on how to test and how to correct unsafe water conditions, 2 color charts and glass test tube with snap-tight cap.